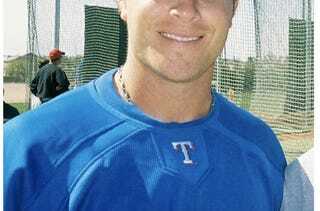 Josh Hamilton Clears The Air, His Conscience And Pleads "Human"
Thanks to Kevin at Big League Stew for his amazing Twitter updates from the Hamilton press conference, attended by Yahoo's(!) Jeff Passan. Hamilton addressed the photos, apologized, and many of his teammates were in attendance. Hamilton claims he spoke with Rangers GM Jon Daniels about the incident — isolated, of course — and that it happened in January. "I'm embarrassed about it, personally, for the Rangers, for my wife, my children and my family," Hamilton said at his locker with a handful of his teammates joining the crowd of media that had formed. "It reinforces one of the things that I can't have is alcohol. It's unfortunate that it happened. I was out there getting ready for the season and took my focus off the number one factor in my recovery - my relationship with Christ. I hate that this happened..."I wasn't mentally fit or spiritually fit," he said. "It just crossed my mind ‘Can I have a drink?' Obviously, I can't. One drink leads to two and two drink leads to 10 or 12. When I was in AA, one saying I heard was one drink is too many and 1,000 is never enough. Alcohol just doesn't mix well with me." Barry will be back tomorrow with a normal routine (hopefully) and I'm sure we'll be talking about this/fighting about this/ruminating about this come Monday as well. Oh and one more thing. I think this story may have saved "Homecoming." You owe me, Reilly. Thanks for your continued support of Deadspin. I know it hurts sometimes.